April 7 is celebrated each year as World Health Day. As Dr. Gro Harlem Brundtland famously noted in her leadership of the world’s first comprehensive look at sustainability, the issues of public health, environmental quality and economic development are not three issues—but one. World Health Day is celebrated on April 7 to recognize the founding of the World Health Organization (WHO) on that date in 1948. WHO is a United Nations agency that focuses on public health concerns around the globe. It employs 7,000 people in 150 countries, 6 regional offices and the headquarters in Geneva, Switzerland. Thoughtful leaders understand that people who are unhealthy (or living in poverty) must be concerned most about their immediate issues—hunger, illness, disability and imminent death. Consequently, they are less likely to act positively on longer-term behavior to enhance environmental sustainability. As Brundtland understood, jointly solving the issues of health, poverty and environmental sustainability is the only successful route to a world of peace and plenty for all. At least half of the world’s people still do not have full coverage of essential health services. About 100 million people are still being pushed into “extreme poverty” (living on $ 1.90 or less a day) because they have to pay for health care. Over 800 million people (almost 12 percent of the world’s population) spend at least 10 percent of their household budgets to pay for health care. At the Universal Health Coverage Forum in 2017, WHO and its partners signed the “Tokyo Declaration on Universal Health Coverage.” It reaffirms the Sustainable Development Goal of achieving a healthy existence for all people by 2030, and sets intermediate targets (by 2023) of extending essential health coverage to an additional one billion people and reducing by half the number of people pushed to extreme poverty by health expenses. Assuring a healthy human population is as much a conservation and sustainability issue as assuring healthy populations of the rest of nature’s species and ecosystems. World Health Organization. 2006. Constitution. Available at: http://www.who.int/governance/eb/who_constitution_en.pdf. Accessed April 6, 2018. World Health Organization. 2017. Tokyo Declaration on Universal Health Coverage. 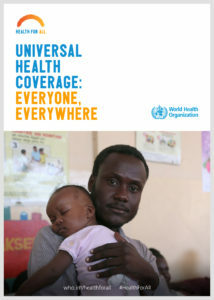 Available at: http://www.who.int/universal_health_coverage/tokyo-decleration-uhc.pdf?ua=1. Accessed April 6, 2018.